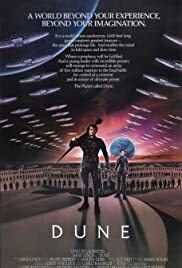 BEFORE: Continuing with the second science-fiction film (actually a 1984 release instead of a 70s release as I thought yesterday) Dune, the film adaptation of Frank Herbert’s novel, is the movie of choice today. Many years ago, I tried reading the novel after my dad suggested it. Not getting past the first chapter, I thought I should just try the movie instead. Interestingly enough, I couldn’t watch more than a half-hour before falling asleep. I guess I’ll find out tonight whether that was due to fatigue or if it’s just a very bad movie. AFTER: Dune deserves an A for effort, but that’s pretty much it. It’s main accomplishment was getting me interested in reading the book again. Despite all the negative aspects, which I’ll get to in a bit, I really got a sense of the mythology Herbert created. That being said, the film is by all means a major train wreck. I certainly see why I fell asleep; it’s just so boring. Sure, there’s a lot going on and information is thrown at you chunk by chunk, but if you’re not fully invested in watching it, your mind can quickly begin to wander. In the first five minutes, you are introduced to the four worlds: Arrakis (aka Dune), Caladan, Giedi Prime, and Kaitain. The major players are also introduced: House Atreides, House Harkonnens, some Emperor guy who is controlled by a big magical alien in a box, and to top it all off, a cult that control your actions with words and a creepy voice. Basically, the whole structure for the next two hours is shoved into your face in five minutes and if you don’t process everything, you’re screwed for the rest of the film. A similar problem, in more ways than one, is the large ensemble cast. The first problem is the wealth of characters you need to familiarize yourself with. Again, a lot of this happens in the opening narration but, at least with the characters, you can figure out who they are through repetition. The second problem is the acting. What terrible acting. And from some great actors as well. Patrick Stewart, Max von Sydow, Dean Stockwell, Brad Dourif; all fantastic actors who were horrible inDune. And it gets worse with the lesser-known actors. I’ll finish by complaining about the structure. The runtime of the film is 137 minutes. The first 75% or so covers, at most, maybe a couple of months. That’s not the real problem. The problem is that the last 25% covers 2+ years. The ending seems totally out of place compared to the rest of the film. It’s as if David Lynch forgot about the last ten chapters and needed to shove them in the remaining time. Not having read the novel, I can’t speak to whether or not Dune was a good adaptation. What I can say is that it did renew some interest in reading the novel. On the other hand, it also turned me off from the franchise. Dune was so bad that it made the appealing parts (e.g. the mythology, the characters, the worlds) unappealing.